Butcher's Choice Meat Collection for sale. Buy online at Zingerman's Mail Order. Gourmet Gifts. Food Gifts. The cuts the butchers keep. 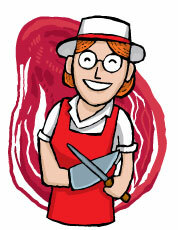 At the meat counter, most of us tend to go for the familiar cuts: the steaks, the chops, the tenderloins. But ask a butcher what their favorites are and it’s like you’re getting entry to a secret meat club. They go for the cuts most of us have never heard of, let alone cooked. It’s our loss—their picks tend to be the most flavorful cuts. We asked some of our rancher and butcher friends about their favorites, and we’ve pulled together a selection to make them proud. Grass-fed tri-tip steak, two grass-fed bavette steaks, heritage breed jowl bacon and a pound of grass-fed ground beef. Shipped frozen, along with a bit of information about each cut and how to prepare it.